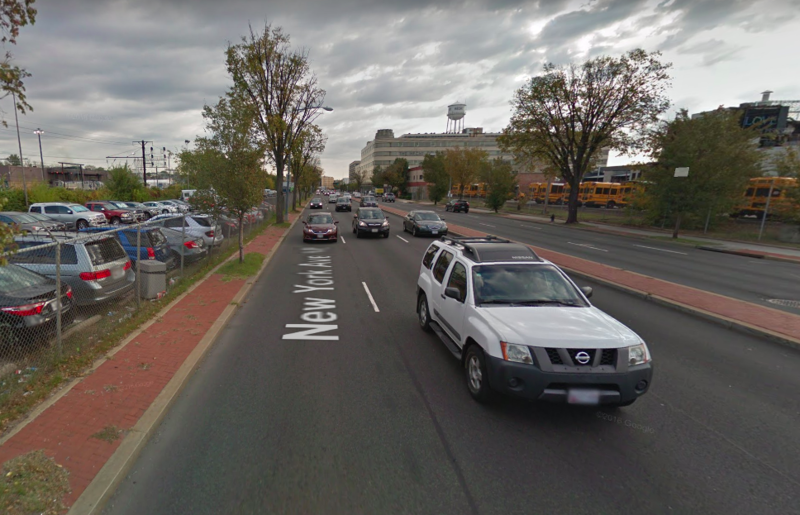 DDOT has finalised the design of a planned trail along the north side of New York Avenue NE (left side of the picture), one of the less pedestrian-friendly streetscapes in the District. Image by Google Maps. 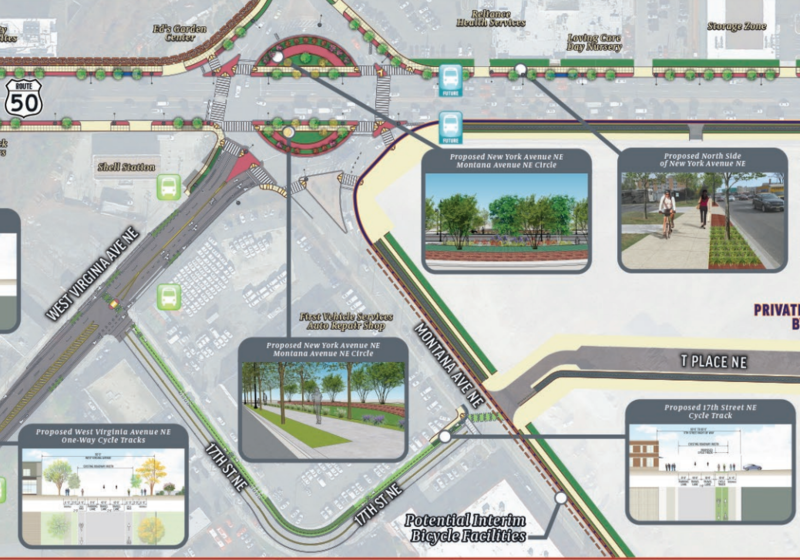 The District Department of Transportation has a preferred design for a new trail along New York Avenue NE east of Florida Avenue, one of the District's most car-oriented thoroughfares. The plan calls for a new bike trail and sidewalk separated from traffic and each other by landscaping on the north side of the thoroughfare as far east as Bladensburg Road. The new trail and sidewalk along New York Avenue will connect Ivy City and points east with the Metropolitan Branch Trail (MBT) in NoMa, creating a new bike and pedestrian corridor through Ward 5. Map showing the proposed trail and streetscape improvements (green) and associated bike facility improvements (blue). Image by DDOT. Beginning at the New York Avenue curb, the plans call for six to eight feet of landscaping adjacent to the road, a six to ten-foot-wide sidewalk, four feet of landscaping and a 10-foot-wide cycle track on the north side of the street, DDOT officials presented at a public meeting earlier in September. The improvements would stretch continuously from the New York Avenue bridge to Montana Avenue NE before space constraints require shifting the bike trail to the south side of the street. A cross section of the preferred design for the New York Avenue pedestrian and bike trail. Image by DDOT. DDOT swapped the locations of the cycle track and sidewalk so the latter was closer to the road from previous plans. Katherine Youngbluth, a project manner working on the study at DDOT, says the change was made to reduce conflicts between pedestrians and cyclists after feedback from residents. The plans do not include use of a tunnel under New York Avenue from Union Market that was in initial proposals. The tunnel may be used by VRE for a new midday storage facility the commuter railroad is planning between New York Avenue NE and Amtrak's northeast corridor tracks. 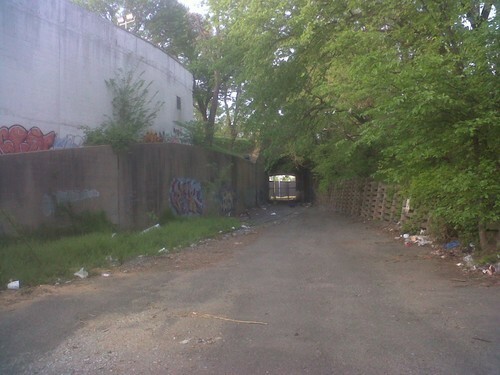 The tunnel under New York Avenue from the Union Market area. Image by Tony Goodman. The separated trail and sidewalk also stops short of the National Arboretum. While existing sidewalks will connect the improved corridor to the national park, cyclists will have to transition to on-street bike facilities along Montana Avenue and neighborhood streets. A map showing potential interim bike facilities on Montana Avenue NE connecting the new trail to the National Arboretum. Image by DDOT. Michael Alvino, another DDOT project manager working on the New York Avenue improvements, said at the meeting that the trail could connect to Fort Lincoln and the Anacostia River Trail in the future. 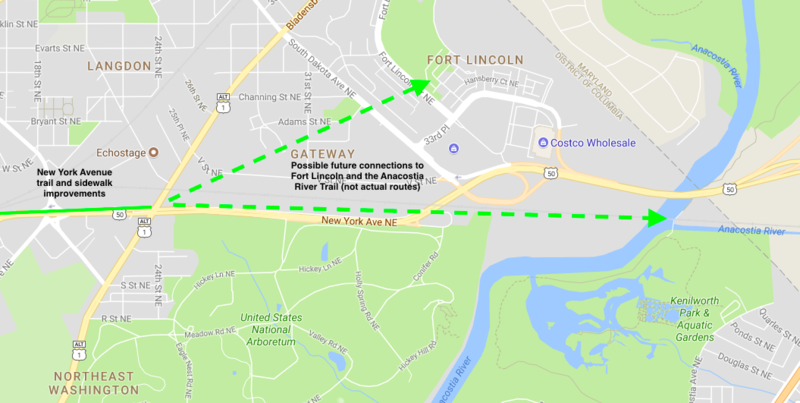 The planned New York Avenue trail could be extended to Fort Lincoln and the Anacostia River Trail in the future. Image by Google Maps. DDOT's plans create a separated space for cyclists and pedestrians—and one that will hopefully be attractive and pleasant as well—along one of the most inhospitable corridors to non-motorized traffic in the city, a six-lane wide thoroughfare that acts as the main gateway to DC from points north and east. The problem? The agency does not have a source for the estimated $27 million cost and will not until at least the 2019 fiscal year or later, officials said at the meeting. The project may not be part of the forthcoming State Transportation Improvement Program, the list of projects DC wants to use its federal funding for over the next four years. If federal funds aren’t used, DC could still pay with local funds, but there are many capital transportation needs, not to mention schools, parks, and much more. Getting funding from the District government will undoubtedly require the support of Ward 5 councilmember Kenyan McDuffie, the mayor, and other elected officials. In the meantime, DDOT plans to finalize engineering plans for the preferred alternative and issue a final report on the planned improvements by October. Then we wait to see if the District moves forward on this important new connection in the city's trail network.